December 15, 2018 & filed under Therapy Tips. 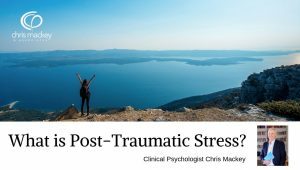 Clinical psychologist Chris Mackey discusses how to manage post-traumatic stress. Post-traumatic stress disorder is a condition associated with lingering painful memories of trauma which the sufferer tries to block out or avoid. Trauma memories and their associated distress can be triggered by other experiences or reminders. Psychological therapy for trauma helps defuse the impact of trauma memories, typically leading to a reduction in anxiety and depression.